Children will be so proud to set it under their tree. Gather your material. 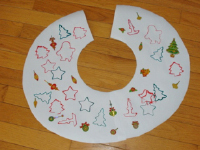 You will need two large half-circles cut out of white paper, Christmas-themed cookie cutters, Christmas stickers (not shown), red and green poster paint, scissors, white glue and/or hot glue, and very wide Christmas ribbon. Glue both half-circles together. 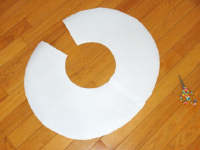 Once this is done, cut a circle out of the centre. 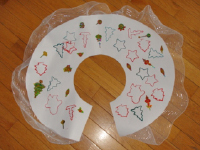 Also cut a slit in your paper circle so children can slide their tree skirt around the base of their Christmas tree. 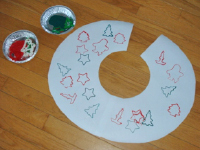 Dip the cookie cutters in red and green poster paint and use them to make prints on the tree skirt. Let dry. Add Christmas stickers here and there, among the prints. 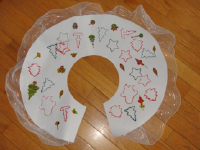 Glue the Christmas ribbon around the outside of the tree skirt. 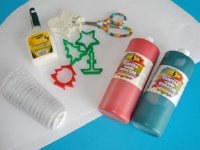 Children will look forward to decorating their Christmas tree and setting their tree skirt under it.